Typhoid Breakfast Recipes, Healthy Veg Breakfast Typhoid Recipes. Breakfast is the most important meal of the day and should not be skipped as it helps in regulating your metabolism rate. People who skip breakfast have lower energy levels. Also when you have typhoid, have small frequent meals through the day. When suffering from typhoid, it is very important to stay hydrated because there is a lot of water loss due to diarrhoea. In stage one of Typhoid we suggest a liquid diet. So we have some strained healthy juices like strained sweet lime juice recipe, homemade strained carrot juice recipe and homemade strained apple juice recipe. Having semi solid foods for breakfast for those with typhoid. You can then start with soft and bland semi-solid foods like Rice Porridge and move on to other easy-to-digest foods like Nutritious Idlis, depending on your individual tolerance. As you get better, breakfast can include bananas, white bread, semolina, milk and milk products (only if tolerated), as they are protein-rich. Try recipes like Banana Uttapa and Cucumber Pancakes. For ovo-vegetarians, we have also included recipes like Scrambled Eggs and Fried Egg. 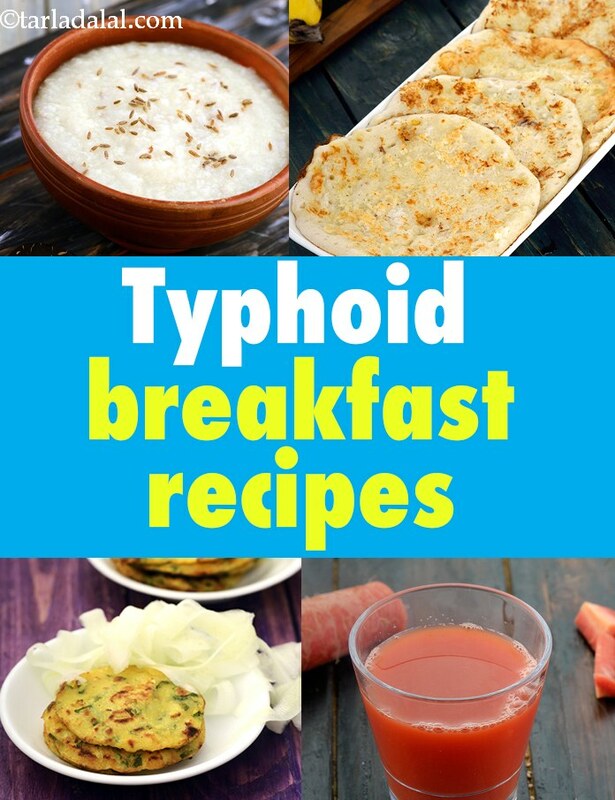 Enjoy our Typhoid Breakfast Recipes, Healthy Veg Breakfast Typhoid Recipes healthy and typhoid recipe articles below.